This Peanut Butter Cup Fudge Pie comes together in minutes, and it’s the ultimate in chocolate and peanut butter decadence! 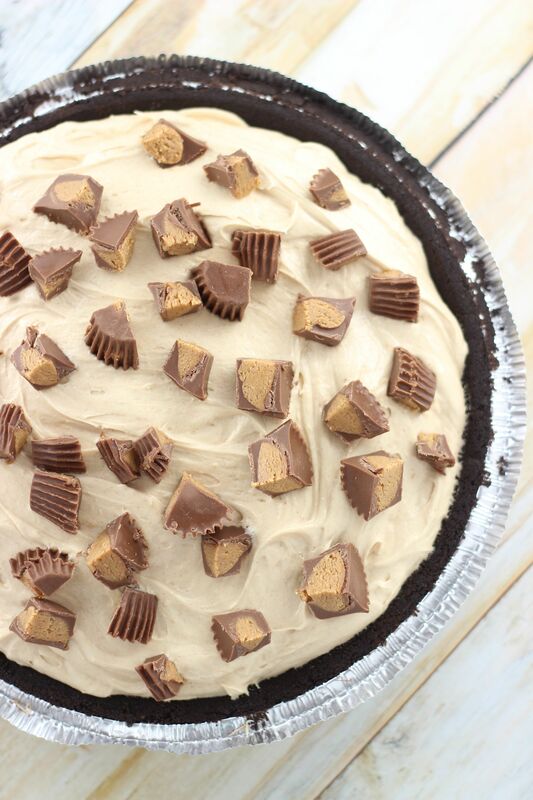 Sure to be a crowd-pleaser, this Peanut Butter Cup Fudge Pie is insanely easy, but so over-the-top! 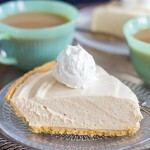 This No-Bake Peanut Butter Pie Recipe is a super popular recipe on my blog. It went absolutely viral this year. One day I started noticing droves of people popping onto my site exclusively to view that recipe, and they’ve never stopped coming for it. I can’t help but shake my head sometimes that it’s this recipe that is the most popular. Not because it isn’t amazingly delicious and simple, but because the pictures are just terrible! You just never know what people will ‘take’ to! All those smart souls looked at the short, but delicious, ingredient list, and the fact that it’s a no-bake recipe that can be made in about 10-15 minutes, and were sold. But the original No-Bake Peanut Butter Pie, while perfect in its simplicity, also has the potential to be taken completely and utterly over-the-top. The original version is a creamy and rich no-bake peanut butter filling in a prepared shortbread cracker crust. Easy peasy, and very straight-forward. 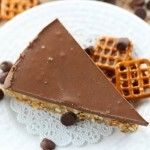 This new, more decadent version, this Peanut Butter Cup Fudge Pie, is still just as simple (truly! ), but really takes things to the next level. 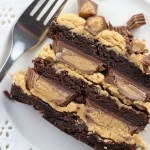 For starters, it combines chocolate with peanut butter! YAY! 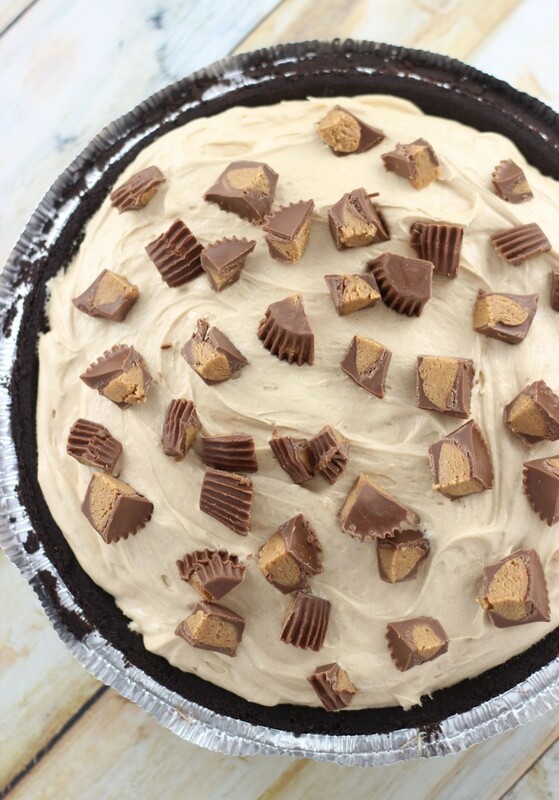 Besides that, this pie features a thick layer of chocolate fudge sauce on the bottom of a chocolate cookie crust, topped with a layer of whole regular-sized Reese’s cups, a layer of the recipe’s original peanut butter filling, and then more Reese’s cups chopped for garnish! 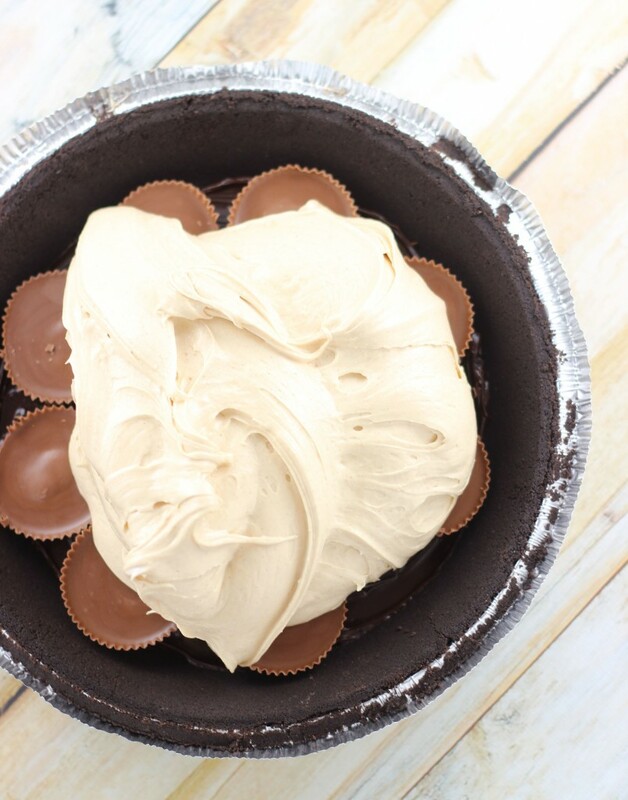 Sadly, I cannot show you a beautiful cut piece that showcases all the wonderful layers – the chocolate crust, the chocolate fudge sauce, full-size Reese’s peanut butter cups, and peanut butter filling. I took this pie to a family get-together, and there were absolutely no remnants at all. Oops. 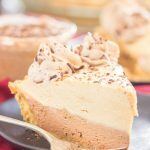 This Peanut Butter Cup Fudge Pie recipe is no less easy to prepare than the original pie, and the decadence is through the roof! And what’s exciting is that I think we may even be able to build on it more from here…..
I’ve also swapped out classic shortbread or graham cracker crust for crushed pretzels, and created this No Bake Peanut Butter Pie with Pretzel Crust. The salty element is fabulous! I did the same with Nutter Butter cookies for this Nutter Butter Peanut Butter Pie. 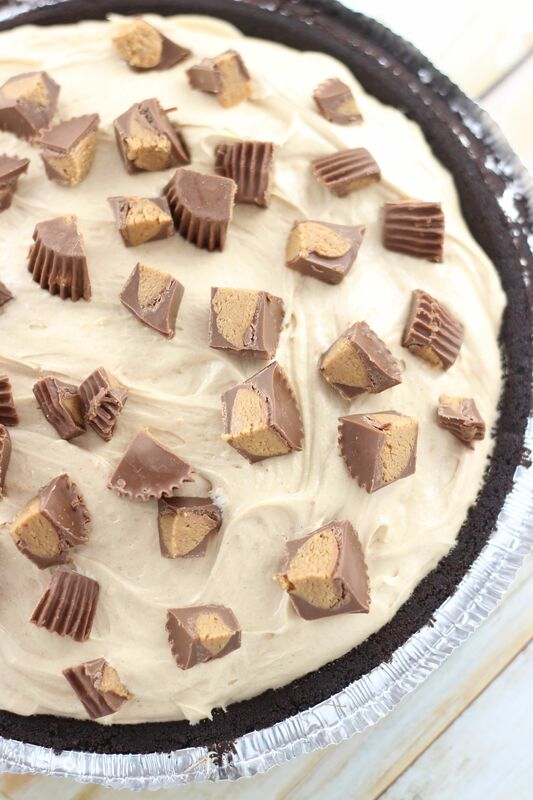 Then I’ve made this pie with even MORE Reese’s cups went into this Reese’s Cup No Bake Peanut Butter Pie recipe. 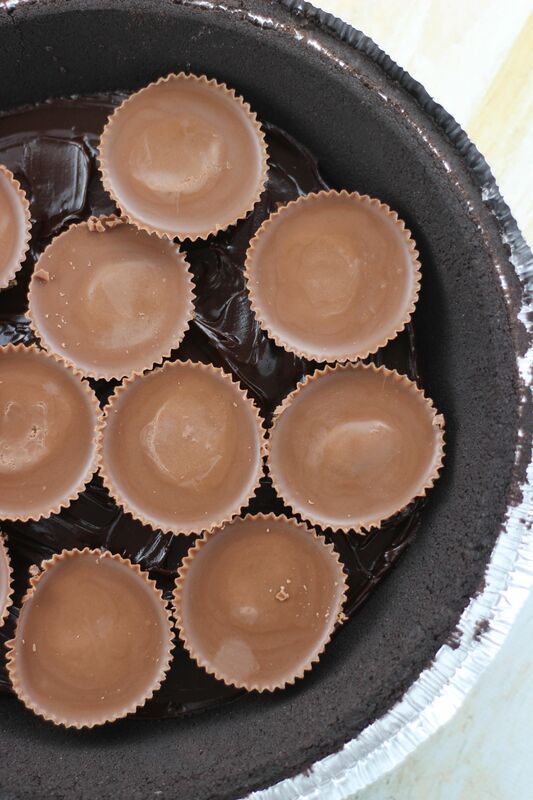 It’s CRAZY with Reese’s cups. Along the lines of combining chocolate and peanut butter, this one contains no candy, so it’s a bit less over-the-top, this No Bake Double Layer Chocolate Peanut Butter Pie Recipe. Love that one.. just a layer of mousse-y, creamy chocolate pie and a layer of peanut butter pie. Last, but not least, this Banana Pudding Peanut Butter Pie recipe. It features a layer of banana pudding pie on the bottom with sliced bananas, and classic peanut butter pie filling on top! SUPER easy, but really beautiful and delicious! 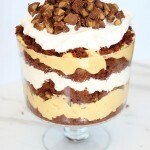 I love no bake recipes and this peanut butter pie looks amazing! Love the PB cups- no wonder both this and the original are so yum!